The event at the Midas Hotel and Casino ended early as the main protagonists finished their bouts with early finishes. 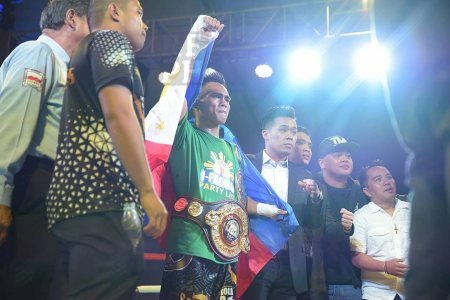 In the main event, Reymart “Assassin” Gaballo crushed his Japanese foe Yuya Nakamura with a thundering left hook at the middle of the second round. Nakamura protested the call for being premature but Referee Virgilio Garcia stood firm to his call. Gaballo has improved his record to W21-KO18-L0-D0. The Filipino champ also scored two knockdowns in the opening round before disposing his foe in the following stanza. “I was trying to size him up in the opening round but his cockiness encouraged me to go for an early knockout while sticking to the game plan. I am grateful to ESPN5, Team SanMan and 1Pacman Partylist for their support”, a happy Gaballo stated. In the co-main event. Romero Duno lived-up to his “Ruthless” moniker by sending his Indian opponent to sleep also in the second round. Duno patiently studied and sized up his opponent in the opening and scored knockdowns midway. Smelling blood in the following round, Duno decided to go for the kill. Dhanda tried to stay away from Duno’s attacks but got caught by a perfect vicious right haymaker that caught him flush on the jaw sending him sprawled on the canvass unconscious. The Indian remained asleep for minutes with the medics attending to him. Luckily he was able to recover and rested in his corner while Duno’s hands were raised in victory. With the victory Duno’s record improves to W20 KO16 L1 D0. In the co-featured bout, SanMan prospect Dave Apolinario kept his clean record as he dominated Romshane Sarguilla winning via unanimous decision. He improves his record to W11 KO7 L0 D0. Sarguilla had his good moments in some rounds but Apolinario dominated the fight with class and excellent ring generalship.